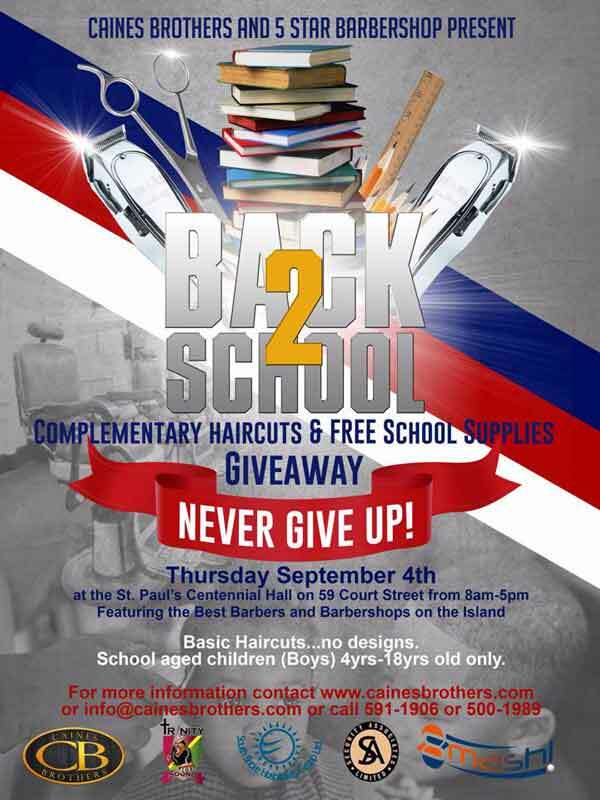 Caines Brothers Productions and 5 Star Barbershop are getting set to host a “Back 2 School” event on September 4 at the St. Paul’s Centennial Hall on Court Street, with free school supplies to be handed out while barbers will be on hand in order to offer free haircuts to boys aged 4-18 as they prepare to head back to school. A post on their GoFundMe page, said: “It is that time of year again when our students are starting to ready themselves for scholastic year 2014 -2015. We invite you to join us in the true spirit of community engagement and giving. “Last year, Caines Brothers teamed up with 5 Star Barber Shop to host a day of “free” haircuts for boys. Five Star Barbershop donated their time and talents to provide complimentary haircuts to families with school-aged children [boys] who were in need of a clean, fresh look to start the new school year. “The event started 8am to 5pm and we were able to accommodate over 215 young men at 5 Star Barber Shop to get their hair cut and to receive complimentary books, pens pencils book bags and other school supplies. “This year we will host the event on Thursday September 4th, at the St. Paul’s Centennial Hall in the City of Hamilton, which will allow for more barbers from various barbershops around the island to participate in a central location. Also, we would like to give away even more school supplies to persons in the community who are in need. For more information, please contact Dwayne or Wayne Caines, or email info@cainesbrothers.com or call 591-1906 or 500-1989.
this is a first class gift to our community. thank-you! Well done Caines brothers leading from the front! thank you to Caines Brothers and 5 star barbershop. I took my son last year and it was a very inspiring experience. I am a single mother with no job. My son recieved a haircut last year, and we got his school supplies from this event. If it were not for this I would not know how I would have gotten my school supplies. Thank you for this, it is a God send. Thank you!!! Please email info@cainesbrothers.com to arrange pick up. Why dont more politians n people follow their lead n stop complaining on the news and radio..blah blah..put your money where your mouth is n help the community in need!! Actions speak louder than words! What an inspiration for us all. Thank you to the Caines brothers and all involved in this positive event.